Technology integration continues at the K-8 Charter School. To refresh your memory, I took a position as a part-time technology instructor at this school starting in September. The previous technology instructors were volunteer parents whose primary focus was on keyboarding skills and using the Microsoft suite. Part of my self-imposed role is assisting teachers in integrating technology into their learning activities and supporting classroom learning during the students’ technology time. A subgoal is to demonstrate how technology integration can be achieved with computers and internet connection and no other costs. Here is the summary, an overview of technology integration for the different age groups that occurred during September. The learning expedition for the Junior High this year is studying Africa, past to present. 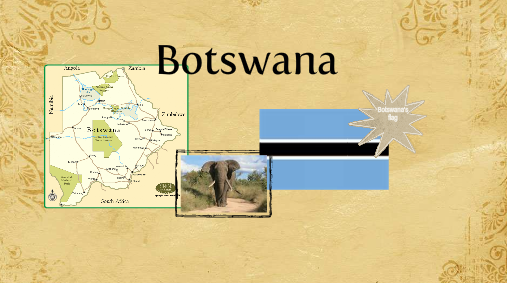 Students have been assigned a specific African country to research, to become an “expert” about that country. A PBWorks was set up for students to post their research. At this point, the students are posting general facts they are finding about their countries. These facts will be used to create Glogs, Animoto videos, and Dipity Timelines. This past week during their technology class, the students were introduced to Glogster. They spent most of their time learning how it works. A few began creating their Glogs about their African countries. Part of their instruction included how to use Google Image advanced search to find images for their Glogs using strict filtering and usage rights “labeled as reuse with modification”. As students discover wonderful books, they will share their reviews and recommendations with each other. 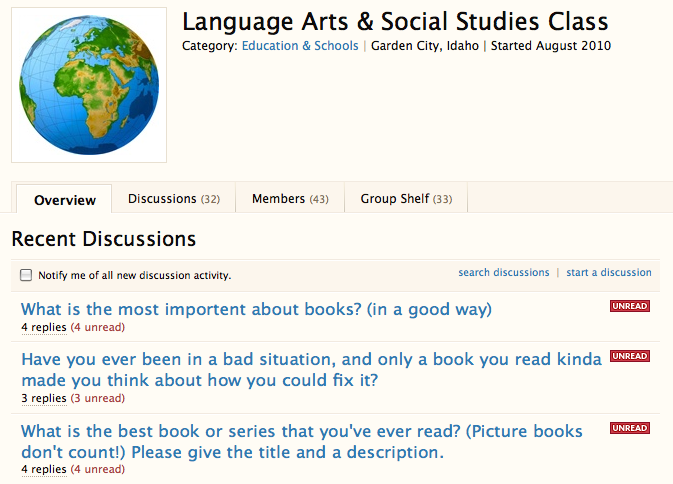 Over the summer a few Anser students piloted an online site for discussing books. 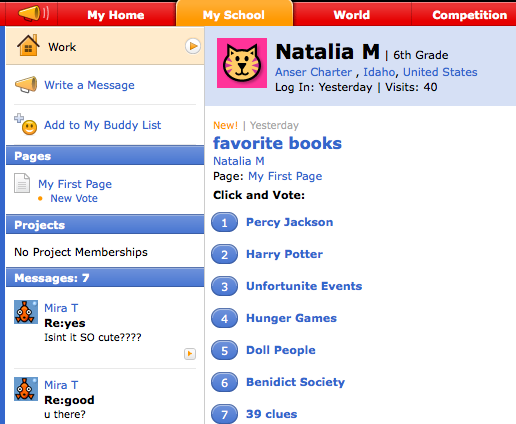 Students found Shelfari.com to be a fun and interactive way to share their excitement about books. On Shelfari, students can create a virtual bookshelf, rate the books they have read, write and read book reviews, discuss books with readers from around the planet, create a reading wish list, and much, much more. Our class will also have a private group where we can safely discuss books we are reading together. Only group members can see our discussions and reply to our questions. Participating students will have a profile (bookshelf and friend list) on the Shelfari.com site. In order to create a Shelfari account, students need parental permission. Shelfari registration requires an email account; however, for the safety of the student, I recommend that you use a parent email to register. A Group Shelf of books was established for the class. One of the beginning of the year projects for the 5th and 6th graders was composing lengthy poems. Where I’m From. 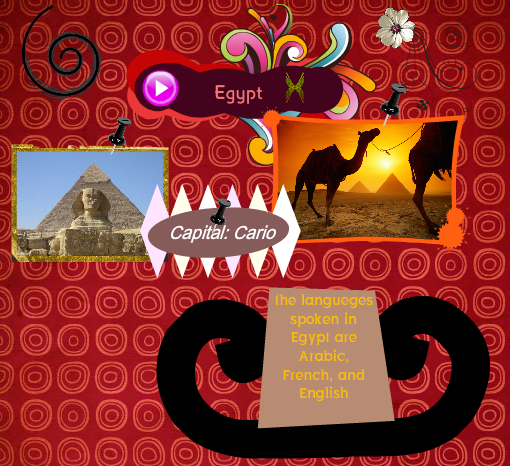 The teachers asked how technology could assist with the expression of these poems in an artistic and visual format. PicLits was the tool I believed could best support this project. I showed the teachers Wordle at the beginning of the year and it immediately sparked the interest of the teachers for the students in these grades. They have requested the creation of word clouds during technology time to support classroom activities. I started with Wordle but wanted a tool that can easily saved as images to the desktop. Wordle does not have this characteristic. After exploring other options, I decided to use ABCya Word Cloud. The Upper Childhood students practiced using it by inserting autobiographical words. The Middle Childhood students created word clouds based on their river expedition. They included words that they associate with rivers. They will create another similar one after they finish their river study. 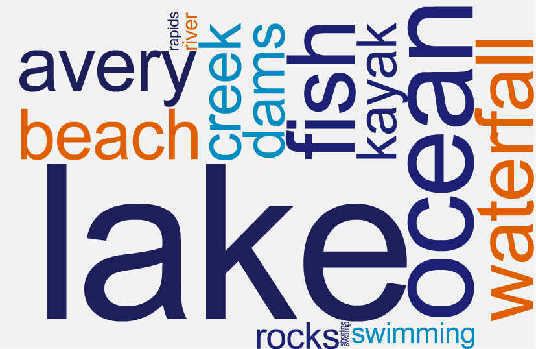 The two word clouds will serve as a pre-post assessment of terminology gained from their river learning expedition. I learn about many of the technology tools I use through Twitter and blogs. Thinkquest was demonstrated to me a few years ago at ISTE’s National Education Computing Conference. I love this site and so do my students. I used it when I was a gifted teacher a few years ago. The students at my “new” school are having the same excited reaction. I don’t understand why I never hear it mentioned in any of my social networks. It is a safe place where students can create an online identify, communicate with other students from their own school and from schools from around the world, post questions and polls, and participate in online projects (way too many benefits to describe in this blog entry). Along with the production tools the students are learning, they have been studying Internet Safety with Professor Garfield. We watch the video together and then the students work through the Try and Apply components at their own computers. Given the variance in the literacy levels of this age group, especially the 1st and 2nd grade group, the challenge has become how to differentiate to meet the needs of all children in the class. I believe that technology provides a great venue for differentiation and it has proved to be the case for this age group. ABCya! is the leader in free educational kids computer games and activities for elementary students to learn educational computer games and activities were created or approved by certified teachers. ABCya! educational games are free and are modeled from primary grade lessons and enhanced to provide an interactive way for children to learn. ABCya! games and activities incorporate content areas such as math and reading while introducing basic computer skills. Many of the kindergarten and first grade games are equipped with sound to enhance understanding. on the web. This site provides options for self-differentiation as students pick their games based on their grade level and interests. For the first half of the Early Childhood classes, I focus on literacy development. Kidblogs were established for those students who have basic writing skills. The kids, at first, weren’t that thrilled about writing the blogs. 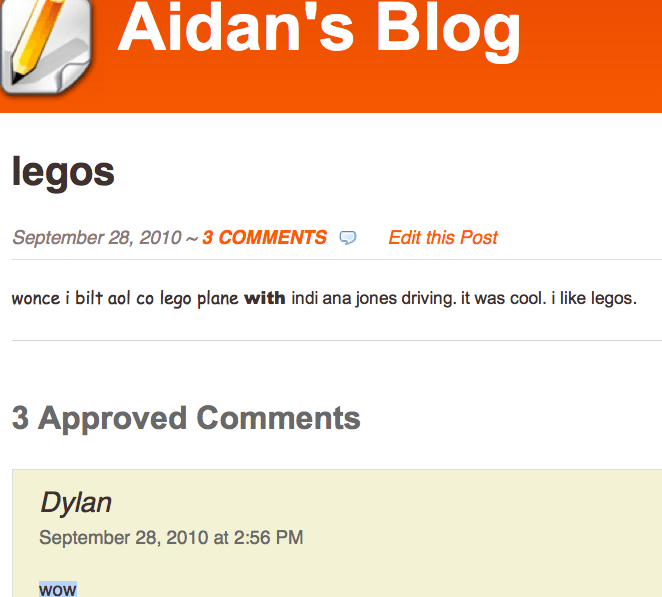 But once they realized they could comment on each other’s blogs, their excitement rose dramatically. One student asked if it was like Facebook for kids. Even at age 7, they understand and are attracted to social networking. While the students are writing their blogs, the other students, emerging readers and writers, listen to and interact with online books such as Pinky Dinky Do. The kids love to draw and paint with online tools. Along with the ABCya games, students have been given the opportunity to draw during the second half of their technology classes. Tux Paint was downloaded on all of the computers in the technology lab. (Note: even the Junior High students like it!). This year I have a new position as a part time technology instructor at a K-8 Charter School. The principal and a few of the teachers/staff, not realizing how advanced educational technology has become, got excited when I demonstrated how technology can be integrated throughout the entire school curriculum. The principal, being the change agent she is, understands that the integration needs to be a process . . . that the first year of my employment should be in assisting teachers to see the benefits of technology integration, and how it can enhance the lessons and projects that are already doing. As a learner-centric educator, I perceive my role as a tour guide of learning possibilities. As such, I offer a menu of options for learner engagement (in this case, the learners are the charter school professional staff). I provide instruction about how to use the tools and examples how they have been used in other educational settings. But then I get out of the way to see if and how the learner uses the technology. I may love a tool but learners may not – I then let it go. I will document if, how, and why these technologies are used throughout the year as a case study of technology integration in a school that has historically had a limited use of technology. Social bookmarking permits websites and online resources to be saved and compiled in a central location. By setting up a group for a school or an organization, users can save them so all members of that community group can view and access them. A wiki allows a group of people to collaboratively develop a Web site. Anyone can add to or edit pages in a wiki — it is completely egalitarian. Encourage student-centered learning. 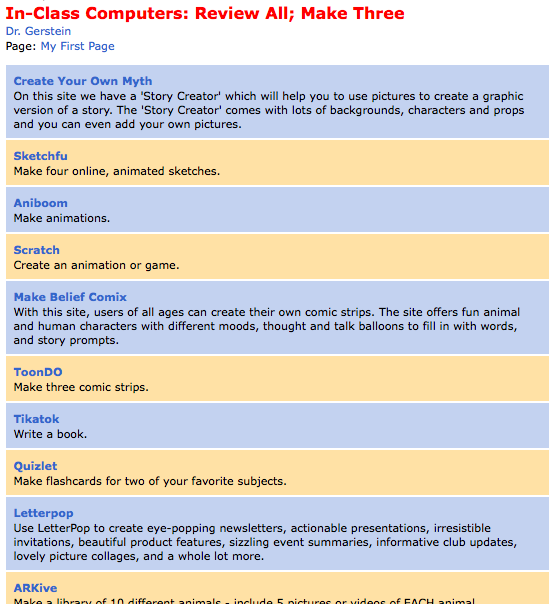 Even young students can build web pages, embed images & video, and post documents. What can you do with a Classroom Workspace? Class Resources – Publish class notes, PowerPoint lectures, schedules and policies; show off examples of great student work. 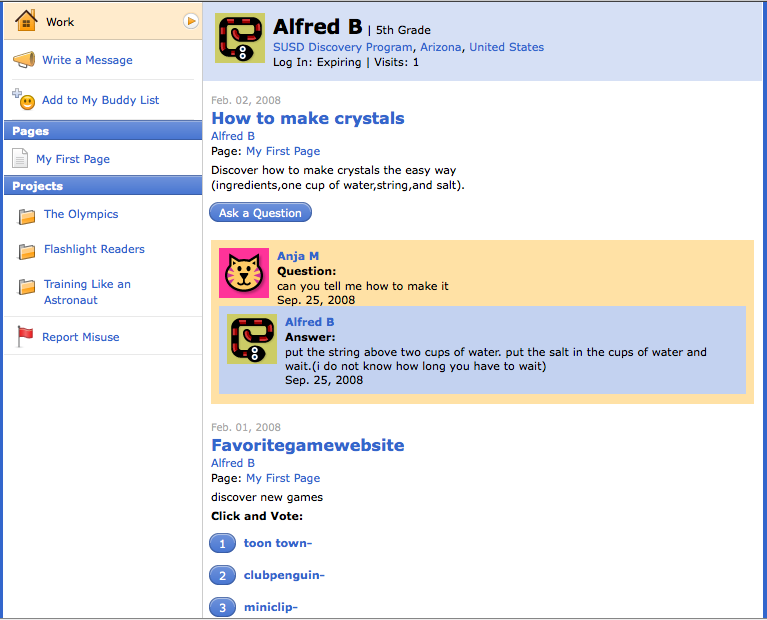 Group Projects – Build collaborative pages, start discussions and encourage comments. Parent Outreach – Keep parents involved. Post assignments, key dates and volunteer lists. All available at home, from work, or anywhere. Student Portfolios – Give students their own page to post content, upload homework, and share their work. Expand Horizons – Share and interact with other classrooms or groups, across town or around the world. GROU.PS is a do-it-yourself social networking platform that allows people to come together and form interactive communities around a shared interest or affiliation. The functionality of any online group is limited only by the members’ collective imagination and ambition. By giving any user the ability to create an easy-to-use, yet powerful, social network, GROU.PS is propelling online collaboration, communication and content sharing in a new socially-aware direction. For those familiar with NING, GRO.UPS is being used as the alternative as NING has become charging for its services. I foresee using the GRO.UPS as a central place to post the different classroom projects. It permits uploading of photos and videos, and the ability to make comments and discussions. 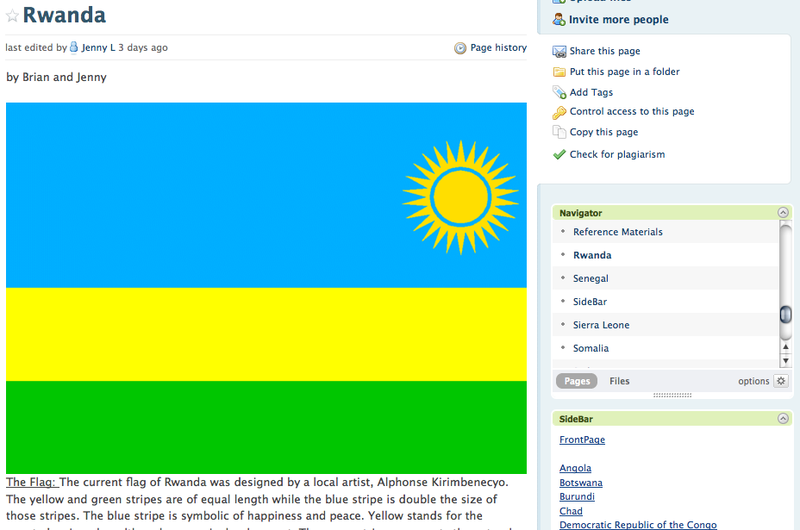 Individual members can create a “My Page” which has some similar properties as Facebook. Blogging is a means of self-expression that extends to nearly every social sphere — moms, entrepreneurs, soldiers, athletes – bloggers can be found in every walk of life, every niche, profession and people group. Everyone has something to learn or share in a blog community. It is that idea that makes blogging such an ideal method of learning for children. Surely Matt Hardy, an elementary school teacher, had this in mind when he created Kidblog.org, a blogging platform exclusively for elementary and middle school students and teachers. The platform creates a safe and simple environment for students to publish posts and participate in discussions within a secure classroom blogging community. Since this is a K-8 school, Kidblogs was selected as the Blog Platform. This is a closed learning environment meaning only ANSER students who are registered by their teachers can use it. If the school was upper level, I would have recommended Edublogs. Special Note: I like Nicholas Provenzano’s idea of staring a Blogger’s Community-Café at his school – see http://www.thenerdyteacher.com/2010/08/creating-blogging-community.html and plan to offer this at my school. ThinkQuest is a protected, online learning platform that enables teachers to integrate learning projects into their classroom curriculum and students to develop 21st century skills. It includes the following: a project environment where teachers and students engage in collaborative learning; a competition space where students participate in technology contests; the award-winning ThinkQuest Library. I think this is underutilized in education settings. It was a favorite technology tool of my gifted elementary student a few years ago. 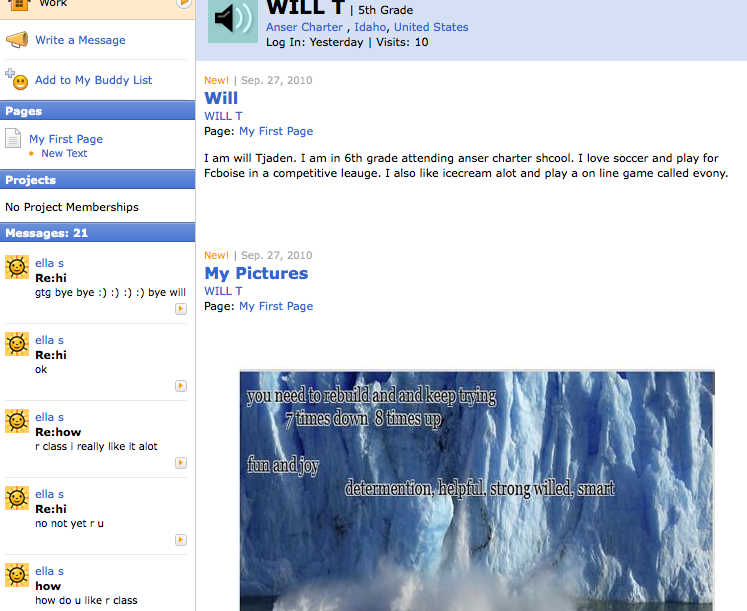 It permits students to set up their own “My Page”. It has many of the same attributes of Facebook – the ability to have a “My Page” where students can personalize their avatar, create polls, suggest links, upload pictures and create discussions. This site can only be accessed by registered schools, their teachers and students. I plan to create accounts for all of the 350 K-8 students as well as offer classroom teachers the opportunity to develop projects. Edmodo is a social learning network for teachers, students, schools and districts. Edmodo provides free classroom communication for teachers, students and administrators on a secure social network. Edmodo provides teachers and students with a secure and easy way to post classroom materials, share links and videos, and access homework, grades and school notices. Edmodo stores and shares all forms of digital content – blogs, links, pictures, video, documents, presentations, and more. This is a closed learning environment meaning only ANSER students who are registered by their teachers can use it. (Need Log-In Code to be go to ANSER Site). Shelfari is a social cataloging website. 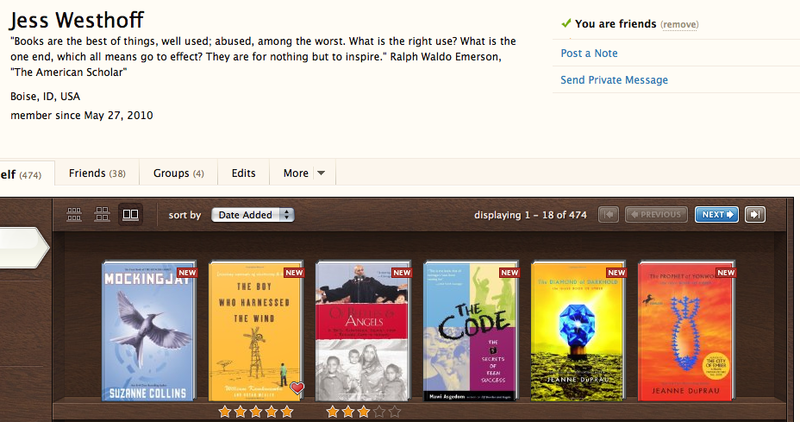 Shelfari users build virtual bookshelves of the titles they own or have read, and can rate, review, tag, and discuss their books. You can also create groups that other members may join, create discussions, and talk about books. I introduced this site last spring during my interview. One of the Junior High Language Arts teachers and a few of the students have been using this site throughout the past summer. A Facebook page is already an active part of the ANSER community. It is used a parent-family informational and PR tool. As I stated, this was my fourth ISTE conference. The first two (Atlanta and San Antonio) were great in terms of learning but lonely in terms of human interaction. When told to network, the muscles in my body tighten in anxiety. If it occurs within a session, I get up and leave or dive head first into my computer. Even though I love 1:1 interactions, I am very uncomfortable initiating those interactions with folks I don’t know. But, interestingly, a shift occurred during the NECC09 in Washington, DC. I had been on Twitter and in Second Life for most of the year prior to this conference. Virtual connections were made and relationships were built during that year. I got to meet them in Real Life at this conference. It was like meeting old friends. We would recognize one another via our Twitter and Second Life names and give hugs like old friends who have not seen each other in a long time. I did not have a “lonely” conference in ’09, but I still focused on gaining technology insights. So I went to ISTE10 with a planner overfilled with what I can learn more about how to “do” this cycle of technology to enhance learning, learning being driven with technology. I attended my selected sessions and started hearing about uses of tools that are commonplace to me now – VoiceThread, Glogster, Google Apps, and found myself online reading Twitter instead of listening to the sessions. Upon later reflection, I realized that with the advent and proliferation of social media – twitter, live webinars, startpages with RSS feeds of blogger sites – I learn about these technology and tools continually . . . not needing a conference to do so. I have been using Helen Barrett’s work on ePortfolios (http://electronicportfolios.com/) for over a decade. She is a lifelong learner and a model of how instructional strategies (in this case ePortfolios) can continually be altered and adjusted to meet changing/emerging technologies. She also showed me some cool iPhone apps and how very fun she is. Anne Collier’s work on internet safety (http://www.netfamilynews.org/bio.html) is among the best. I had some amazingly intelligent conversations with her about the internet. She reinforced for me that it is important to do your research. She uses intelligent, logical, research-supported arguments to demonstrate that the internet can be a safe place for our students. I have been learning about Bernajean Porter’s work on digital storytelling via Second Life for some time (http://www.bjpconsulting.com/) . She always seems to plant a “nugget of insight” into my thoughts that wasn’t there before. During some one on one time with her, I discovered her passion for Vision Stories (http://www.ustream.tv/recorded/7979510). This fits with my penchant for narrative therapy. Passion-to-passion connection is extremely powerful. I have no doubt we will make it grow into something new and exciting for the both of us as well as with those we teach. The beginning of the conference for me was Edubloggercon (http://www.edubloggercon.com/EduBloggerCon+2010). I came late after a flight and was a bit disoriented. After a first session in this state, I settled into a session facilitated by Angela Maiers (http://www.angelamaiers.com/) and Jeff Utecht. My brain kicked into gear as the discussion turned to how to teach kids about digital citizenship. I went up to Angela after the session to introduce myself and thank her. She was one of those folks I got to know virtually during the past year. Upon introducing myself, she gave me one of those old friend hugs . . . a genuine, strong, connected hug. For an introvert like me, it connected me to the social aspect of the conference. One of my “deepest” discussions occurred during my last hour at the conference as I met Kevin Honeycutt (http://ktls.net/?q=kevinh). He articulates so passionately, beautifully a world that respects and honors the learning of all kids. It has almost perfect congruence with my beliefs and he says it so much more eloquently than me. No one wants or needs obsolete excellence in education. We’re training kids for routine cognitive work which is increasingly disappearing. 40% to 55% of students are dropping out of school. If 40%-55% of business widgets didn’t work, it would be out of business. Increasingly the education system is trying to fit standardized tests into the non-standardized brains of students. When I get excited about “things”, I want others to experience those “things”. I understand the need to social connection and interaction, but found myself disappointed that those waiting for the #edchat to start did not hear his message. BUT because of the magic of technology, his talk was recorded and can be watched here – http://www.istevision.org/viewsession.php?id=120 I encourage all to do so. So what I learned/re-learned at ISTE 2010 . . . Pedagogy + Technology + Content + Connection (noting that these are integrated, synergetic . . . flowing in and around one another) = Rich, Engaging, Authentic Learning (for me, at least).